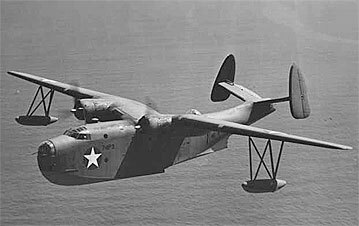 Martin Mariner flying boat in flight. U.S. Government photo. A Diversion is a fictional short story that describes an incident where two marines assigned to the security contingent for the Sangley Point Navy Air Station were involved. It happened during the time the United States Marines in Korea were heavily engaged with the enemy in a number of crucial battles. The story describes what some marines far from the battlefields were doing while the war went on in Korea. Pete and Tony, two PFC Marines, had been part of a base security contingent stationed at the US Navy Air Station Sangley Point in the Philippines for the past five months. Pete and Tony had completed boot camp in San Diego two weeks before the North Korans had invaded South Korea and the Cold War suddenly turned hot. Soon after that the United States Marines hastily putting together the First Provisional Brigade to send to Korea. By the fickle finger of fate Pete and Tony ended up at Sangley Point doing guard duty rather than shipping off to Korea as part of the First Provisional Brigade. Pete and Tony was an odd pair; Pete a six foot two, blond, blue eyed farm boy from South Dakota and Tony, a ruddy first generation Mexican American who called San Diego California his home town. Both had just turned twenty and full of testosterone. They weren’t friends in boot camp but became close friends after arriving together in the Philippines. For Pete, Tony’s Spanish was a plus because it gave them an in with the mestiza women in Manila. Pete and Tony followed news about the Marines in Korea who fought battles to hold the Pusan parameter, then led the landings at Inchon and were now in the mountains in North Korea fighting the Chinese. Pete had mixed fillings about their situation as part of the security at the Sangley Point Air Station. He had enlisted in the marines with a neighbor farm boy, Chris, who ended up in the First Provisional Brigade. He had told Tony that sometimes he wished he was with Chris, fighting in Korea like a real Marine. A couple of weeks later Pete and Tony had agreed to meet that afternoon in the enlisted men’s club when Pete finished his main gate watch. They decided to go to the patio at the back of the club where they would be in the shade that time of the day and drink a cool frosted mug of San Michaels beer. The patio projected out over the bay and provided a view of the workings of the sea plane base that was part of the Sangley Point Navy Air Station. Sangley Point also had a runway to handle land based planes. Land based and seaplane patrol planes based in the west coast of the United States rotated in and out of Sangley point on six month tours. There were four other land-based patrol planes parked in a restricted area at Sangley that didn’t rotate. They had their own guards and were involved in some secret activity. Base personnel had started calling the secret outfit the 50-footers because of a rumor that if you got closer than within fifty feet of their area, they would shoot you. While Pete and Tony drank their beer a lumbering seaplane moved to a takeoff position. They watched the seaplane for a while as it sat in the bay like a half-submerged turtle. Pete said that the navy called it a PBM. “Bet that thing can’t fly,” Tony surmised. The plane finally got itself lined up for takeoff. Pete and Tony could hear the two engines roar and half submerged plane started moving slowly through the water. It gathered speed and the plane rose up and started planing through the water like a high speed motor boat and the ugly duckling was soon flying. “I’ll be dammed, it does fly,” Tony admitted. Two days later a rumor circulated that a PBM had run into a mountain on Bataan Peninsula during a rain storm. A few days later at muster they were asking for volunteers to go up the mountain and pick up the remains. Anyone interested, let your platoon sergeant know. As soon as muster had finished Pete collard Tony and said he was going to volunteer and wanted to know if Tony wanted to go. “Will we be spending nights in the jungle or on the boat?” someone asked. “How do we get the remains out?” someone else asked. Pete began to feel queasy just thinking about it. The crash site team boarded the LCU on Friday. While they waited to get underway, Pete and Tony visited with Sergeant Klowoski. The conversation steered Pete’s mind to Chris, his South Dakota buddy. Very likely Chris was in the middle of those hellish conditions. God, Pete thought, boredom is my biggest problem. After two hours of cruising, the LCU reached the entrance to Manila Bay and passed between the tip of the Bataan Peninsula and Corregidor Island. They cruised along the west coast of the Bataan Peninsula for another two hours until they reached a place near the crash site. They pushed up to the beach and prepared to spend the night on the landing craft. It had started to rain, so the team rigged up a tarpaulin on the back half of the open deck to shelter their sleeping cots. In the morning Pete, Tony, and the rest of the team headed into the jungle to make their way to the crash site. They were loaded down with everything they would need to live in the jungle while they worked at the site. Their gear included shelters, rain wear, and water and food for three days in addition to eleven body bags, six rolled-up stretchers, and gear to be used for extracting body parts from the wreckage. The two-tiered jungle consisted of a high canopy which grew above thick, almost impenetrable undergrowth. Five marines at a time were set to work with machetes in half-hour shifts to hack a path through the undergrowth. When a team started a shift, they slipped off their heavy packs and took the machetes from the marines who had the previous shift. Pete, familiar with hard work, had no doubts that he could handle cutting a path through the jungle with a machete. Since age sixteen, he had been throwing around feed sacks weighing a hundred pounds and pitching heavy bundles of grain during threshing season in the hottest part of the South Dakota summer. Pete did the math. “’Bout nine years,” he said. After finishing their shift the team walked back down the path they had cleared to retrieve their packs. Tony recounted all of the reasons it had been such a mean job, including that they were working on a steep incline. By the time the team took a noon break, they were more than half the distance to the crash site. The party opened C-rations for lunch but had little time to relax. After half an hour, Sergeant Klowoski put the next team of trail-breakers to work. “We need to get to the site in time to set up camp before dark,” he said. “Tomorrow we’ll get started on the job we’re here to do.” That afternoon the usual tropical shower developed, and the men donned rain gear and kept going. They arrived at the site of the crash in the early evening. The plane had flown straight into a mountainside that inclined about forty-five degrees so the area of impact was relatively small. The navy investigators established a perimeter around the site and the team set up camp just outside the perimeter. The investigators spoke to the team members who would be removing the bodies, described the plans for the following day. The investigators would first do a walk-around with the marines and navy medics to find the downed airmen’s bodies and identify things the investigators didn’t want to be disturbed during the bodies’ removal. During the walk-around, the marines would hack down any foliage that might impede the work. The walk-around would take most of the following morning. It had grown dark by the time the team ate their C-rations, and many of them turned in early. It had been a long day, and the following day would be no exception. The marines and medics spent the next morning walking the crash site with the investigators to flag all of the visible bodies and body parts. It was not a pleasant experience for Pete. He had seen dead people before: a cousin who died young of leukemia, his grandmother on his mother’s side. They were laid out in fancy coffins, dressed in their best, looked like they were sleeping. These bodies didn’t look anything like that. He had tried to prepare himself for what he expected to be a difficult experience, but reality overpowered his imagination. The crash had occurred almost a week before, and the bodies were infested with maggots and insects and had been mutilated by feeding animals. An appalling odor pervaded the site. At lunch time, Pete couldn’t eat. He lay in his hot pup tent and tried to prepare himself for the afternoon ahead. After the mid-day break, the medics and marines split into two teams. They donned face masks, rubber gloves, and aprons and went to work. Each five-man team worked with a body until they were satisfied they had identified the crewman and had bagged the body and all of its parts. Pete and Tony were on the same team. The first body they worked on had been torn apart at the torso. There were dog tags identifying the upper torso, and the medics identified a lower torso with a missing leg to go with it. A partially eaten leg was linked to the one-legged torso by shoes on the two feet which matched in size, type, and amount of wear. Pete found the actual bagging of the bodies didn’t bother him as much as the walk-around had that morning. The initial shock must have prepared him for what had to be done in the afternoon. By evening, eleven body bags were laid out along one side of the crash site. The next morning, the marines and medics teamed up to carry six of the bodies to the LCU. Each pair of men would carry a body on a stretcher two miles down the jungle path the team had cut two days earlier. Pete and Tony found the two-man carry possible though difficult. Ten-minute breaks every half hour made the task bearable. The route that had taken a day to cover when they were cutting the path to the crash site took only two and a half hours to navigate when they were carrying out the crewmen’s bodies. After reaching the LCU and placing the bodies below deck, the marines returned to the crash site and picked up the last five body bags. When these had been placed aboard the LCU, the marines returned a third time to collect any gear they had left at the campsite. The navy crash investigators, who had spent the day at the crash site, returned to the LCU with the marines on the last trip. It had become dark by the time the LCU backed off the beach and started the four-hour trip back to Sangley Point. Pete and Tony relaxed and rested their aching muscles as the landing craft pushed its way through a calm sea. Pete, although tired after the day of taxing physical effort, felt satisfied. He tried to communicate his feelings to Tony. “I think we did something important the last few days,” he said. “So you think we should just leave them up there?” Pete asked. “We agree on that,” Pete replied. “And better than being shot at” Tony added. They dropped the subject and talked about getting together with a couple of mestiza sisters living in Manila the following weekend.